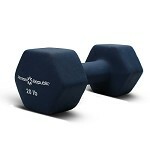 Fitness Republic Neoprene Dumbbell 20 lb. This Fitness Republic Neoprene Dumbbell is made of cast iron and is coated with soft and smooth coating that is not slick and is easy to grip! This hand weight is used to work on upper and lower body and to tone muscles!